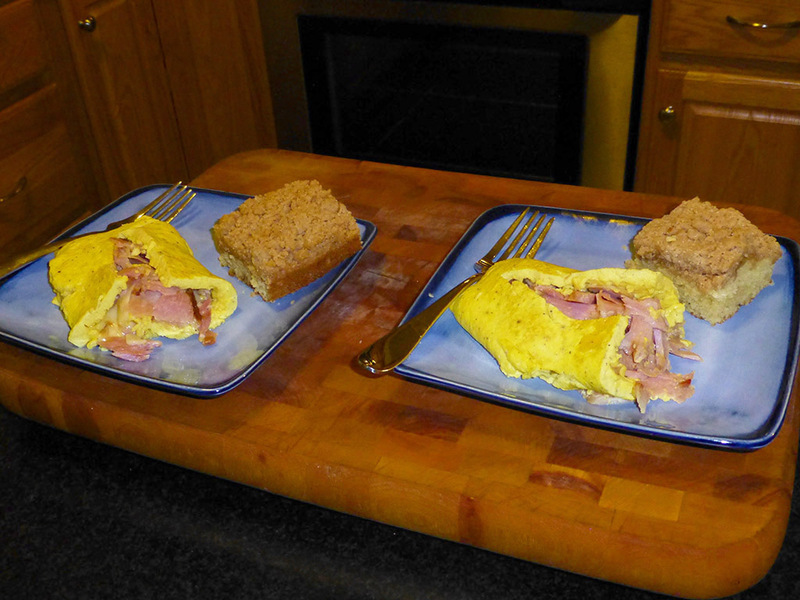 After Christmas Eve dinner of cider-baked ham, breakfast Christmas morning was a shared four-egg ham and cheddar omelette with Americanos and the always delightful cinnamon crumb coffeecake from the King Arthur Flour Baker’s Companion, recipe below. Makes two 8-inch rounds, one 13 x 9-inch pan, or one 9- or 10-inch tube pan. Preheat oven to 350 degrees F/175C. Grease two 8-inch round cake pans, a 9 x 13-inch pan, or a 9- or 10-inch tube pan. TO MAKE THE CRUMB: In a medium-sized mixing bowl, whisk together the flour, sugar, salt and cinnamon. Melt the butter in the microwave or small saucepan and add the vanilla extract and almond extract to it. Pour the butter into the flour mixture and mix until all the butter is absorbed and you have a uniformly moistened crumb mixture. Set aside while you make the cake batter. TO MAKE THE BATTER: In a large mixing bowl, cream the butter and sugar until light and fluffy. Add the eggs one at a time, and beat between additions. Scrape down the mixing bowl, then beat in the vanilla and sour cream. In a medium-sized bowl, whisk the flour, baking soda, salt, and baking powder together. Add to the butter/sour cream mixture, mixing until evenly combined. Pour the batter into the greased baking pan(s). Crumble the crumb mixture over the top, until the batter is completely covered. Bake for 20 to 25 minutes for 8-inch rounds, 30 to 35 minutes for a 9 x 13-inch pan, or 35 to 40 minutes for a 9- or 10-inch tube pan. Bake until a tester inserted in the center comes out clean. Remove the cake from the oven and cool on a rack; dust the top with confectioners’ sugar, if desired. This entry was posted in Cooking and tagged cheddar, cinnamon crumb coffeecake, ham, King Arthur Flour, omelette, recipe. just a little ding here at the cake section! Can’t remember if I told you about a japanese cake recipe without flour that you would swear to the heavens did have the stuff! And no butter either! Beans ( i made a puree of black beans) , ground hazelnuts, eggs and sugar (used a bit of rapadura or whole sugar) Boy is this moist and a great cake! Im going to try switching out the starch in the beans for sweet potatoes and see what that gives me next ! That will allow me to use less sugar I think…at any rate, I’m tryin’ it ! best to you lalo ! So appreciate that you continue this blog and allow us to continue our food and airplane dialogue ! You are more the airplane poster but I enjoy those posts too even if I don’t always write a comment!